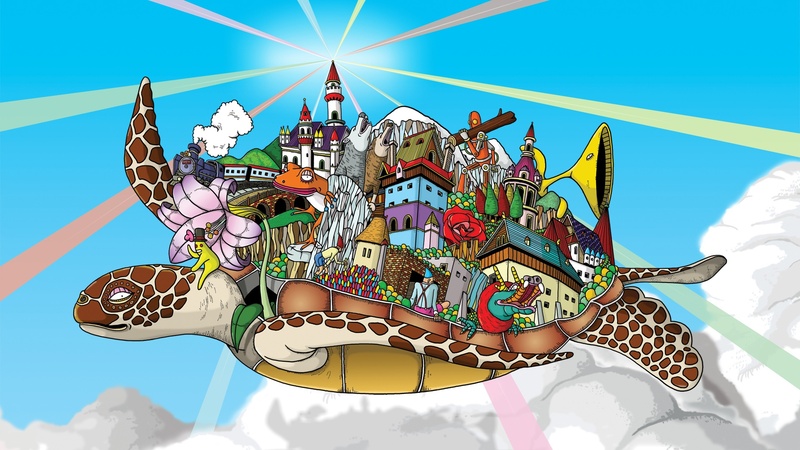 To say that I’m a fan of Terry Pratchett’s Discworld is an understatement. Among the humorous fantasy writers, Terry Pratchett has pride of place. At his right and left hand are Douglas Adams in sheer satiric glory, and Neil Gaiman, whose humour shades into great darkness. These three are the trinity of holy hilarity in contemporary fantasy. And the second of the three have fallen. 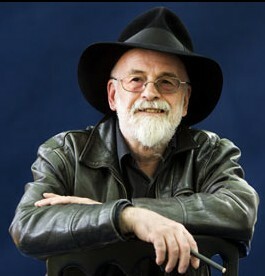 Today Terry Pratchett passed away. Although I have cherry-picked any of his Discworld books at random–as they crossed my path–last year I started reading through chronologically, I am now about to finish Reaper Man–a reread to me, featuring the deadly and delightful character, Death. I don’t know the effect these words had on you when you first read them, but for me they were a temenos, the threshold between my chair and the faërie woods beyond the hedge, the invisible bridge from now to myth. The prologue was a magic ring, a desperate wish, an open wardrobe door. If I had a penny for every time someone asked me where I got the idea of the Discworld, I’d have—hang on a moment—£4.67. Anyway, the answer is that it was lying around and didn’t look as though it belonged to anyone. 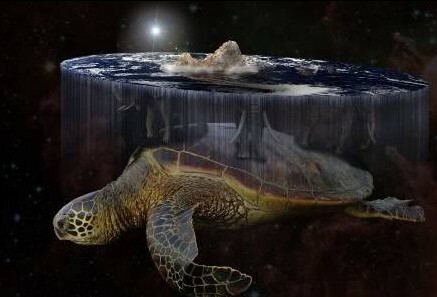 The world rides through space on the back of a turtle. It’s one of the great ancient myths, found wherever men and turtles were gathered together; the four elephants were an Indo-European sophistication. The idea has been lying in the lumber rooms of legend for centuries. All I had to do was grab it and run away before the alarms went off. I actually bumped into this idea—save the elephants—in a legendary lumber room of my childhood, though I can`t remember where exactly. I kind of think it was a book on finance I found lying around the house. I was a strange child. In any case, Terry Pratchett thought it was a ridiculousity worth capitalizing on. I think we’re all glad he did. I didn’t discover Pratchett and Discworld until I was well into adulthood. I tentatively shared a couple of chapters of a novel I wrote with a friend. He said, “Oh, this sounds like Terry Pratchett.” It’s the thing that writers hate to hear. I borrowed one of his books, and sure enough, Terry Pratchett had stolen my writing style. I was pretty disappointed at first. But as I was drawn into the story, I fell in love with Pratchett’s characters and the enigmatic metaphysics of Discworld. I have come to realize since that writers write in a tradition. Someone will emerge with a Pratchettian voice. If the wound is not to dear and the world is so very good, we may take a risk. 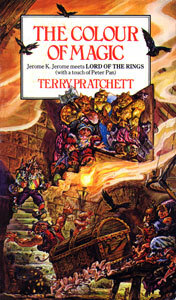 Until then, until another master of speculative hilarity emerges, I tip my hat to Terry Pratchett, and slowly run my fingers through my beard as Rincewind races from one dimension to another, as the multiverse’s tallest Dwarf takes control of a crowd, and as the great Turtle A’Tuin slowly drifts through a universe far, far away. This is one time I wish Death hadn’t sharpened his scythe. 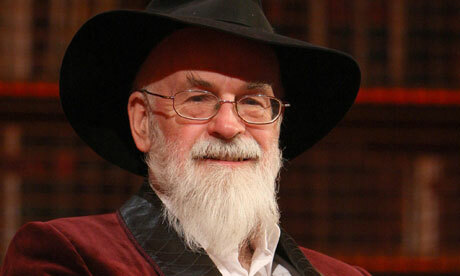 Do you have writings about Pratchett’s world or your favourite stories to tell. Link below or tell it in the comments. This entry was posted in News & Links, Reflections and tagged Death, Discworld, Douglas Adams, fantasy, Fictional Universes, fictional worlds, Multiverse, Neil Gaiman, Reaper Man, speculative fiction, Terry Pratchett, The Colour of Magic, threshold. Bookmark the permalink. Reaper Man is one of my favourites. That scene where Death sharpens his scythe on a ray of sunlight is pictured so clearly in my mind, I might as well have been there when it happened. That, I think, is one of the reasons his stories are so great: he had the gift to draw you in, and in spite of how utterly ridiculous every aspect of the story was, you can’t help but imagine it is real. It is a brilliant scene, and this may have been my first book–this or Interesting Times, or Colour of Magic. I suspect it was Rincewind before Death–I can’t remember. I never was able to develop a fondness for Rincewind, but now I think I should give him another try. I think he’s a character that only a child or a childish adult would love. I found him in my early 30s! That’s an interesting question, how the author and augment or ruin our reading! Besides the cowboy hat, I’ve left Terry Pratchett’s biography out. He was an atheist, not as vehement as Douglas Adams, but a coy one. And he argued for his own right to die, though it didn’t happen (well, the suicide didn’t happen). There is one theory in Pratchett that gods (literally) are born and die based on their popularity, so belief creates the gods. That’s the “Golden Bough” anthropology from a hundred years ago. But he also has the with of Chesterton, and views the world upside down. I have a Kipling gap. I just never got him as a kid, and haven’t gone back. I know he’s important, but when authors hint back at him, I’m at a loss! I’ve heard of euhemerism, but why not katahemerism? The opposite of ‘euhemero’ (whence his name) would appear to be ‘dyshemereo’, ‘to be unhappy’: how ‘dyshemeristic’ the effects of euhemerism may (tend to) be, seems a worthwhile question! I’ve lately sung in Mendelssohn’s St. Paul oratorio for the second time, and the selection of narrative details is striking – Saul approving of the stoning of St. Stephen and zealously persecuting the Christians, apparently thinking the idea of Incarnation blasphemous nonsense, followed by meeting Christ on the road to Damascus, being convinced, and baptized into Him, followed by the Lystrans supposing Barnabas and he are the gods Zeus and Hermes descended to them in human forms and preparing to sacrifices steers to them accordingly. And Sørina Higgins’ splendid recent edition of Williams’s Chapel of the Thorn where some (crypto-)pagans’ high ideas of the divine or divinized hero, Druhild, contast interestingly with the pagan mystic bard’s ideas – based on experience (as he interprets it) – of ‘the gods’ or ‘god’, has got me thinking about Williams and euhemerism and baleful human aspirations in his fiction and later, Arthurian poetry (Mordred admiring his understanding of the Emperor of China as ‘Son of Heaven’ and wanting to imitate him in his own way, for example). It sounds like you have a tiger by the tail there! Good call, and I didn’t get the parallel in Mendellsohn before (not being a great sympathizer in classical music–only a distant, ignorant admirer). I see it in Williams. Sørina’s book came a month ago and I’ve read it cover-to-cover once–including your article. I got read it at the Wade too, though not in full. Dyshemerism, truly. But katahemerism moves the “dys” to “evil.” I was also thinking of parahemerism, or antihemerism, or dyslogic euhemerism. I like playing with the Greek. history –> legend —> myth –> faint cultural memory. I like playing with Greek, too! It is a name (whether unusual or not, I don’t know, nor how anybody would end up with it) – I’m assuming the verb (which I misspelled before) lies behind it: ‘euhemereo’. The only dictionary I’ve checked so far gives its senses as ‘1. sunshine. have good luck, feel good’ and ‘2. be sunny’. I have never yet read the surviving fragments of his Sacred History. One summary I read says he claims to have seen a pillar in a Temple of Zeus on the island Panchaia with an inscription identifying Uranos, Chronos, and Zeus as humans honored as gods, in contrast to the cults of Sun, Moon, Stars, and Winds. Hmm… ‘Sun’ as (real?) god and ‘sun-kissed’ Euhemerus? Anyway, lots of dangerous, pernicious, evil possibilities in falsely equating human and divine in various ways! Less bad, equally bad, worse, than equating non-human created persons with the divine (as planetary Intellegences are treated as having been, in That Hideous Strength, or Sauron’s cult of Melkor in Numenor)? That’s a great story. Is it an example of euhemerism! Love the ironic possibilities. I just finished watching Percy Jackson with the family. My son, 10, loves all the books and is eagerly waiting for the author to finish the Norse series. It certainly has given him a good founding in mythology–better than mine.